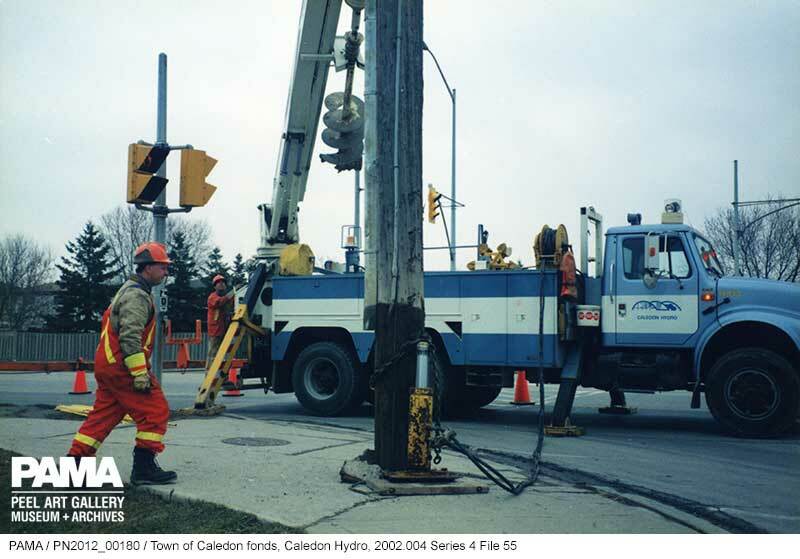 Caledon Hydro installing hydro lines and hydro poles, around 1990 to 1999. Our archives holds records that show how electricity has been delivered in parts of Peel by publicly owned utilities – a tradition of ownership that seems set to change. This will mean our hydro records will gain a new significance, especially when it comes to judging the wisdom of such decisions. A privatization consultant has recently recommended that the Province of Ontario sell off 60% of Hydro One and 100% of Hydro One Brampton, which serve Caledon and Brampton, respectively. In both cases, municipalities decided to purchase these private companies in the early 20th century, to ensure hydro was universally accessible. Hydro records at the Peel Archives could shortly become a window on an otherwise closed chapter of Brampton and Caledon Hydro: we have records from both corporations covering their time as publicly owned utilities. If you’re a researcher interested in comparing how public and private systems measure up, you may one day want to take a look at these records! 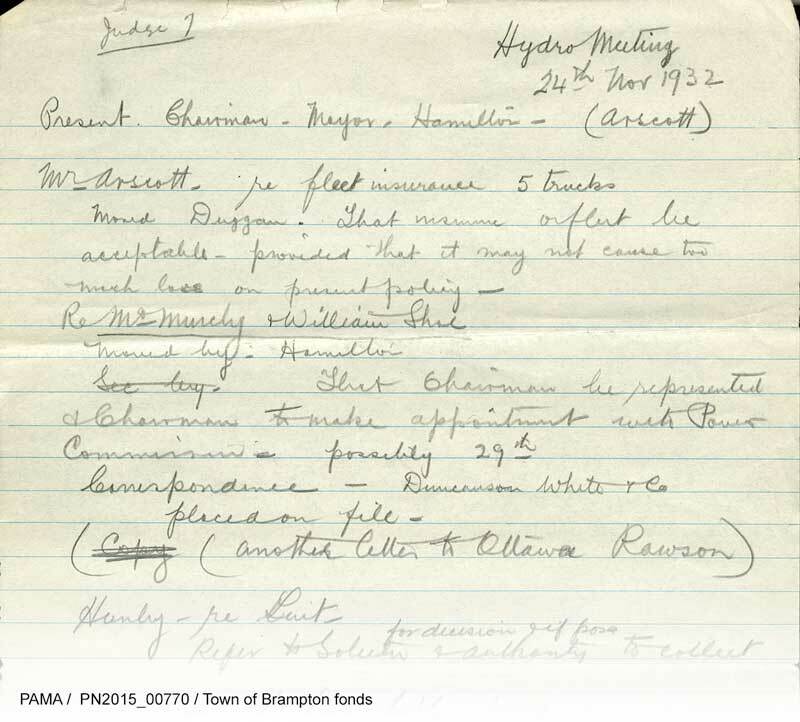 Chief among the Caledon Hydro records in our collection are a business plan, business papers related to due diligence and employee matters, valuation of the utility, and a lengthy share purchase agreement. While the service dates back to 1915, our records for the Bolton Hydro Electric Commission and Caledon Hydro run from the 1950s to 2001, including a variety of photography. Want access to the records? Visit the archives and ask for “Caledon Hydro records”, 2002.004. The archives’ selection of records from Brampton Hydro is much smaller. 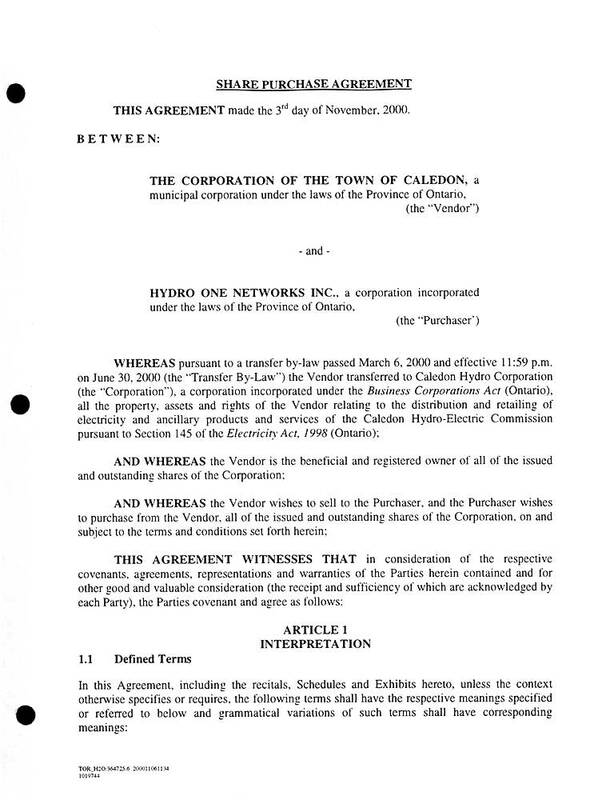 Brampton Hydro was sold to Hydro One in 2000, becoming Hydro One Brampton; it was never merged with the rest of the system. With the exception of published records like annual reports (1973-2000) and City maps, the only records PAMA has ever received from Brampton Hydro are from the early part of the 20th century. The file includes undated negotiations by the Williams Shoe Company over their electricity contract, a lengthy letter from the Town about maintenance of the system, 1911, and eight meeting minutes for the Commission, from 1932 and 1933. Want access to the records? Visit the archives and ask for “Brampton Hydro Electric Commission minutes, submissions”, 1985.148 Series 1.5. Interestingly, there’s a connection between Brampton Hydro and PAMA. The Peel County Office Building at 50 Main Street South, built in 1959, is now PAMA’s art gallery. During the 1980s, the Region of Peel leased this building to Brampton Hydro, for use as its headquarters. The archives holds notes, copies of memos, and copies of reports related to this era of the building’s use. This is the first post in our “Collection Highlights” category where our staff reveal some of their favourite finds and let you know about records with tie-ins to events in the news.